Balans restaurants are a historic fixture of Soho’s dining scene with a devoted following and relaxed attitude which has now stretched beyond its restaurant and café in Soho, with restaurants in Shepherd’s Bush, Stratford and most recently Kensington High Street. The chain has also travelled across the pond and opened several branches in Miami, Florida. The Balans brand is currently undergoing a major rebranding exercise to become ‘Balans Soho Society’ in a bid to emphasise the roots of the business and it’s alternative bohemian culture. Balans restaurant's collaboration with Café Reality dates back to September 2014, when we were presented with the opportunity to become involved with the rebranding of one of their West London restaurants. Café Reality worked in partnership with Balans throughout the duration of the Kensington project, however, the vision stemmed from an unlikely source. Internationally respected Simon Costin, typically known for his expertise within the art industry and his relationships with luxury brands such as Gucci, was asked to redesign the restaurant chain's image. This had to coincide with the restaurants bohemian reputation, and reflect the eccentric ethos of London’s Soho, where the Balans brand was founded in 1987. Balans Soho Society in Kensington continued with the newly adopted modern yet rustic design concept by selecting 50 ferro chairs with upholstered seats (as pictured above) to shape the main dining area. 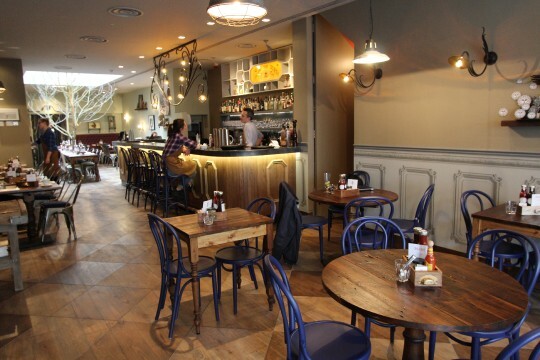 The anterior of the restaurant was to be fashioned with bespoke ‘Check Coloured Bentwood Chairs’. Its solid beech carcass coated with the Night Blue finish provided a deep, rich colour which blended into the rustic backdrop effortlessly. Mita Wooden High Stools were chosen to add the finishing touches to the 'Balans Soho Society', Kensington’s already prominent interior. 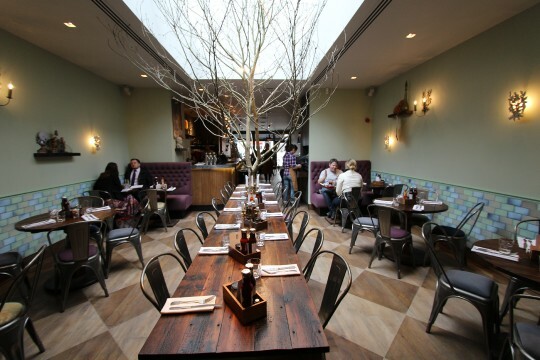 Balans Soho Society, Kensington were enormously pleased with their new restaurant and the furniture they received. With three more chains yet to be rebranded we hope to be working with David and his team in the very near future. "This is the second rebrand project we have undergone and we have chosen Café Reality for both. We have been very pleased with the furniture received thus far. Especially with the customisations we’ve been able to make due to the resourcefulness that Café Reality possesses. I am sure we will be acquiring Café Reality’s services in the very near future".